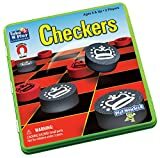 The Checkers rules are quite easy to learn. In fact, it looks easy to win at checkers, but it is more difficult as we think. We need to have some plan worked out in the game. Even the first moves we do should have a purpose. We should aim to target small objectives that contribute to the achievement of the main goal. We must try to make every turn count in our favor as much as possible. It's important to know the purpose of a capture because they are not always beneficial. We need to understand the different consequences of double and triple captures and the principles behind positioning as far as captures are concerned. We should be able to control areas on the board and the enemy as well. By a forced capture we can make the enemy make a move he didn't want to do. Such forced captures are a very powerful weapon in checkers. We need to learn how we can further exploit it to trap the enemy. The more we play the game and try out strategies effectively, the more we make everything easier in the game. Beginners often place their checkers on the edge of the board. This seems like a reasonable strategy, because your pieces on the edge cannot be captured. But as it turns out, pushing your checkers to the edges is a mistake. Try to form a pyramid shape with your pieces. Because of the possibility of forced moves, your opponent can presents you with a capture you must take. Because of this, you cannot afford to sit back and fortify. You could be forced to jump your checkers into oblivion at any time and no defense that you build can stand up over time. Attack only on the strong side and defend only with on the weak side. If you wish to become a master player, you need to learn how to "plan" and not merely live from one move to the next. Stick together when you advance. A single checker advanced can easily be jumped and captured while a checker backed up by two more checkers is immune from capture. If you press forward with a few checkers then your advancing force will be much more powerful. A kinged piece is incredibly powerful. The player who kings more checkers will usually win. While capturing opposing checkers is generally a good thing, your biggest concern should always be kinging your own checkers. You should be willing to trade a capture for a capture when it advantages you. 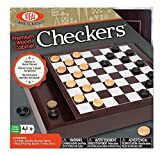 Use this to capture an opponent's advanced checker or to clear out some of his base row checkers. Sacrificing a checker to clear a path to be kinged is always worth it. If you can trade one pieces for two, you made a good choice. With only 12 pieces on the board for each player, it is quite possible that you may quickly end up with a 8-7 piece advantage and if you can trade four pieces, you suddenly have a 4-3 advantage which is a tremendous amount of power. Your opponent cannot get any kinged checkers without advancing into one of your four home spaces. Keeping these spaces occupied guarantees that your opponent will get no kings until your checkers move. Attack you opponents "Double Corner"
It is preferable to break through the Double Corner side because a piece that crowns can usually emerge there more easily than one which reaches the Single Corner. Once only a few pieces are left on the board, the path to kingship will be open. Don't trade pieces blindly if it means that your opponent will be closer than you to get a king. If you cannot move a piece on your turn, you lose. If you can block in your opponent's checkers, you will win. While winning is fun, you can't learn much by playing against weaker players.